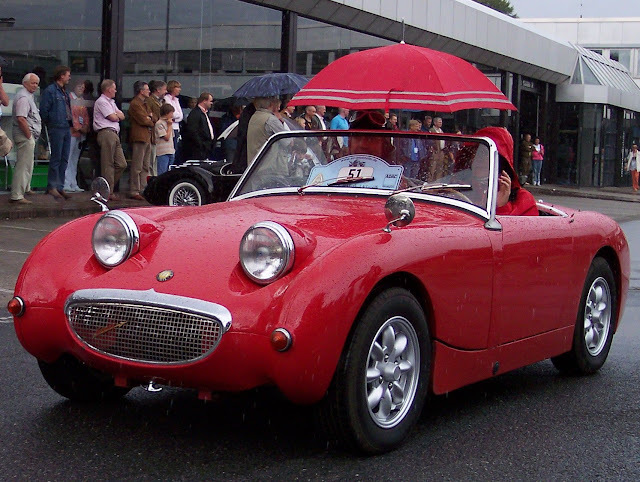 The Austin-Healey Sprite Mk1 must be in the running for the cutest car ever made! Its most adorable feature? Some may plump for its seductive smile - in the form of an almost 'emoticon'-style grille. Most, though, would go with those foxy 'frog eyes' ... after which the car was nick-named. Ironically, they almost did not appear. Donald Healey - the Sprite's designer - wanted the car to have retractable headlights. Mercifully - for classic car buffs - the cost of fitting them proved prohibitive. So, 'pop-up' became 'pop-eyed' ... and a legend was born! But, the Sprite was not only about styling. A top speed of 84mph was quite acceptable, at the time. Particularly, since the Sprite's in-line four engine produced just 43bhp. Capacity was 948cc. There again, there was not a lot to lug about ... the Sprite measured just 3.5m in length! The 'Frog-eye' was economical - 45mpg the reward for careful driving. Though, tweaking the 'A Series' engine was a breeze. The whole of the one-piece nose section came up, allowing for easy access. The Sprite's four-speed 'box served up the power in bite-size chunks. The Sprite was the younger sibling of the '3000' - or, 'big Healey', as it was dubbed. So, BMC's shelves were laden with parts, to bolt straight onto the Sprite. Most components had also seen service on Morris Minors, and Austin A35s. 38,999 Frogeyes were built. However, Healey broke the mould after they had built the Sprite. Never again would a car be quite so cuddly!